Saturdays, only in July and August. After docking, passengers will have a chance to visit the island. Vulcano is well-known for its black beaches, its sulfur waters, its thermal spas… all of which were created by volcanic activity. In the early afternoon, passengers will re-board and set off to Panarea; before arrival, they will be given a short boat tour of the Calajunco Bay, the beach of Zimmari and the promontory of Capo Milazzo – on whose top sit the remains of a prehistoric village dating back to 1400 b.C..After docking, passengers will stay on the island for about one hour and will have a chance to visit the town of San Pietro. They will then re-board and set off to Stromboli.Along the route, the boat will coast the small archipelago opposite the island of Panarea. 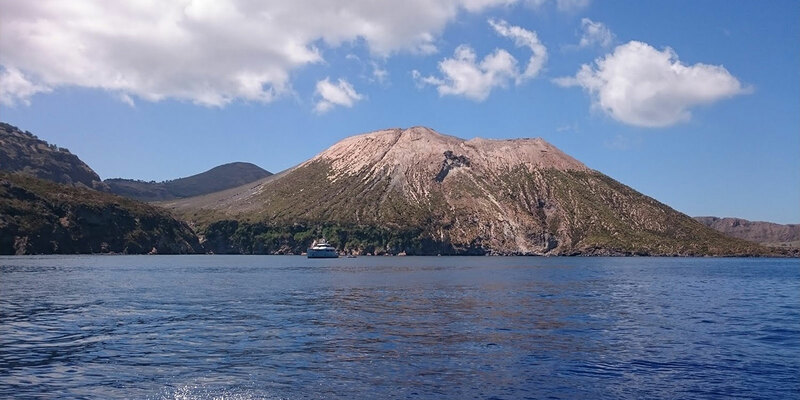 Following on, the boat will sail along the coastline of the town of Ginostra and finally dock in Stromboli Scari. At sunset passengers will re-board the boat and approach the Sciara del Fuoco – a path naturally etched by lava when it flows out of the vents and into the sea. The boat will opposite the Sciara, giving passengers an opportunity to watch the nightly eruption of the active volcano. Children 4-10 yo € 50,00. Any entrances fees to the Eolian Islands are not included. Please note that all boat tours are conditional upon the adequate sea and weather conditions, at the boat captain's discretion. In the event of cancellation due to adverse conditions passengers will not be entitled to a price reduction.